Rustic DIY Save-the-Date Booklet made from Tree-free + Recycled Paper. Booklet folds over in an Ethiopian book style. 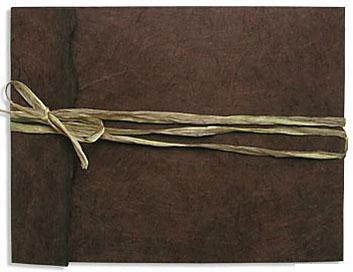 The cover is made from handmade lokta paper -- with the look and feel of leather. The cover is diecut and scored for easy assembly. Wraps with a 1.5 yard length of two tone paper raffia. Very handsome and rustic. Booklet style Save-the-Date with foldover flap. Wallet style. Measures 12" x 4.25" open. Cover made of handmade paper from Nepal with 2 printable sheets of 70 lbs post-consumer recycled paper. Chocolate brown handmade paper with milkweed (beige with yellow overtones) printing sheets and envelope. Envelope liner made from creamy yellow colored mulberry paper. Two-tone paper raffia. Cover Wrapper:Handmade (tree-free) lokta paper from Nepal. Scored. 12"x4.25"
Envelope: Matching milkweed post-consumer recycled A2 size - 5 1/2 inches x 4 1/4 inches. Envelope Liner: Mulberry paper liner. Binding:Two tone natural paper raffia for old style sewn and wrap binding.